Project X HZRDUS 6.0. Srixon Z585 9.5 Stiff Flex. Club is in very good condition - played about 10 rounds. Srixon Z 545 Driver 9.5 with Fubuki 60 R Shaft. Shaft is less than 6 months old and Driver comes with tool as shown with extra weight. Does not have a head cover. Club is in good condition. Length is 45.5 and has great feel. 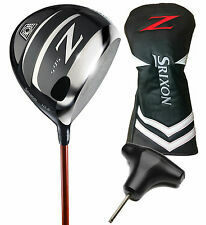 Srixon Z 565 9.5° Driver. Graphite shaft - Hand Crafted Project X Even Flow 65g 6.0 Stiff flex. All single pieces (drivers, fairway woods, hybrids, single irons, wedges, putters. ). Srixon Z585 Driver Head Mint Condition. Condition is Used. RH and 10.5*. Bought this new a few weeks ago and hardly used it. Maybe 20 Balls on the range. No Headcover. Shipped with USPS Priority Mail. Srixon Z785 Driver HEAD ONLY. Condition is Used. Great shape still! Used RH Srixon Z565 10.5* Driver - Miyazaki Tour Issue Graphite Regular R Flex . Condition is Used. Shipped with USPS Priority Mail. Even though the driver is Preowned, I don't think it has a scratch anywhere. Absolutely mint condition. The black grip is stamped Golf pride 360 TOUR VELVET and is brand new. Shaft Model - Miyazaki Tour Issue 6S - International 4665. Model - Z 745. Shaft Flex - Stiff. Grip - Golf Pride Tour Velvet. Dexterity - RH. Type - Driver. Brand New Srixon Z785 9.5* Driver Project X HZRDUS BLACK 6.0 Stiff H/C And Tool. Condition is New. Shipped with USPS Priority Mail. Srixon Z Star 10.5° Driver. Graphite Shaft - Miyazaki 61g Stiff S Fl ex. All single pieces (drivers, fairway woods, hybrids, single irons, wedges, putters. Headcover Not Included / Tool Not Included. ). Srixon Z785 10.5* Driver w/ PX HZRDUS Handcrafted!!! Dr iv er h as b ee n us ed 5 r ou nd s. F ac e is p er fe ct o nl y th in g ha s co up le o f sc ra tc he s on t he t op b c of t op pe d sh ot s. Sh af t is s ti ff a nd v er y ra re. Dexterity: Right-Handed Shaft Material: Graphite Loft: 9.5 Club Condition: EAGLE. We take actual images of the item you are buying! 2 Eagle: Excellent condition. Very little wear. 4 Par: Good condition with normal use. 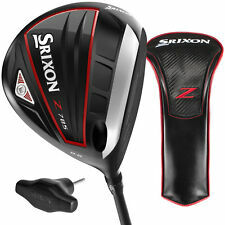 LIKE NEW Srixon Z785 10.5 degree adjustable loft driver extra stiff X flex right hand. $499 retail driver has only been hit at driving range. Loft can be set to 9.5, 10.0, 10.5, 11.0, & 11.5 degrees. Shaft is factory installed HANDCRAFTED Project X HZRDUS Black 62 gram 6.5 flex, designed for low spin & low launch. Standard length of 45.25 inches w/ Golf Pride Tour Velvet 360 grip & factory head cover both in like new condition. Comes with Srixon wrench tool, hosel tuning manual, & Srixon drawstring pouch. Last 2 pictures show actual product label & authenticity stickers that have since been removed. Check my PERFECT seller feedback and purchase with confidence. SHIPS FREE USPS PRIORITY to continental US & Hawaii only, thank you. All clubs are standard length and lie unless otherwise noted. Condition: 7 out of 10 - Good: These clubs/iron sets have been played in an appropriate fashion. The wear is typical for an item of similar model/age and has been well taken care of to date. 2018 Srixon Z585 9.5 DEGREE DRIVER HEAD ONLY. Condition is Excellent 9 /10. The Z 785 is a 460cc driver with a tour preferred look and profile. It features the Ti51AF Cup Face, a stronger, faster, and lighter face that produces excellent ball speed for increased distance. The Quick Tune System allows you to effortlessly adjust the loft and swing weight. Srixon Z 765 10.5° Driver Project X HZRDUS Handcrafted Black 6.0 flex FREE SHIP! Srixon Z 765 10.5° Driver with Project X HZRDUS Handcrafted Black 6.0 stiff flex shaft and headcover. Condition is used. Head shows scratches and smudges to the clear coat in and around the crown. Dexterity: Right-Handed Shaft Material: Graphite Loft: 10.5 Club Condition: BIRDIE. 5 Par : Fair & functional condition showing significant use. 4 Par: Good condition with normal use. Mild marks; a few scratches or nicks possible. Srixon Z 565 Driver RH Regular GREAT DEAL! Condition is Used. SRIXON Z 565 Driver 10.5 Adjustable MyGolfSpy Most Wanted Driver 2017. The head loft is 10.5 but adjustable 1 or - in loft and also adjustable for lie. The Mayazaki shaft is standard for this driver. Model: Z765. The Driver has 9.5 degrees of loft. This model is adjustable but the wrench is not included. There are different loft settings on the hosel. Manufacturer: Srixon. Shaft Material: Graphite. Shaft Model Grafalloy Tour Prototype BiMatrx. Flex Stiff. Buying more than one item?. Item has been heavily used and shows signs of abuse. Performance will not be effected. Item has been played for several seasons, and has been heavily used, but not abused. Model: Z765. Srixon Z765 Driver is in very good condition with a few hairline scratches on the face and crown. It features a Miyazaki 6S Tour Issue shaft with a Golf Pride CP2 Pro Midsize grip. The club has 9.5 degrees of loft. WANT TO TRADE IN YOUR OLD CLUBS? Dallas Golf wants to buy your used clubs! We are proud to be one of the largest buyers of used golf clubs anywhere! We pay top dollar for name-brand equipment from the past six or seven years. Want to know how it works? Just send us a message via eBay!. These clubs are Demo condition. Will show signs of minimal use. Overall the clubs are in very nice condition. A great value for a great club! Headcover Included. Grip: Golf Pride Tour Velvet 360. Maple Hill Golf. Used Srixon Z565 Driver 9.5 Stiff. Miyazaki 5S International flex code 5544. Comes with tool but no head cover. Shipped with USPS Priority Mail. Club is in great shape. It’s has lite scratches on the face and sole from normal play. This is a small paint rub on the crown near the toe however it is very hard to see. It is not noticeable at all when addressing a ball.